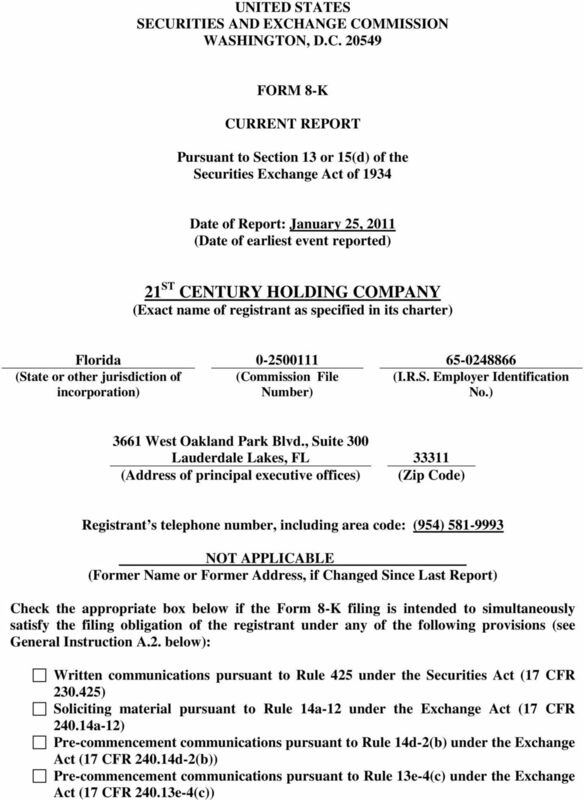 Download "21 ST CENTURY HOLDING COMPANY (Exact name of registrant as specified in its charter)"
9 shall be cancelled and no PARENT Common Stock or other consideration shall be delivered in exchange therefor. 2.2 Procedure for Exchange Following the Effective time, the certificate(s) representing the shares TARGET Common Stock owned by PARENT (the TARGET Certificate )shall be cancelled. 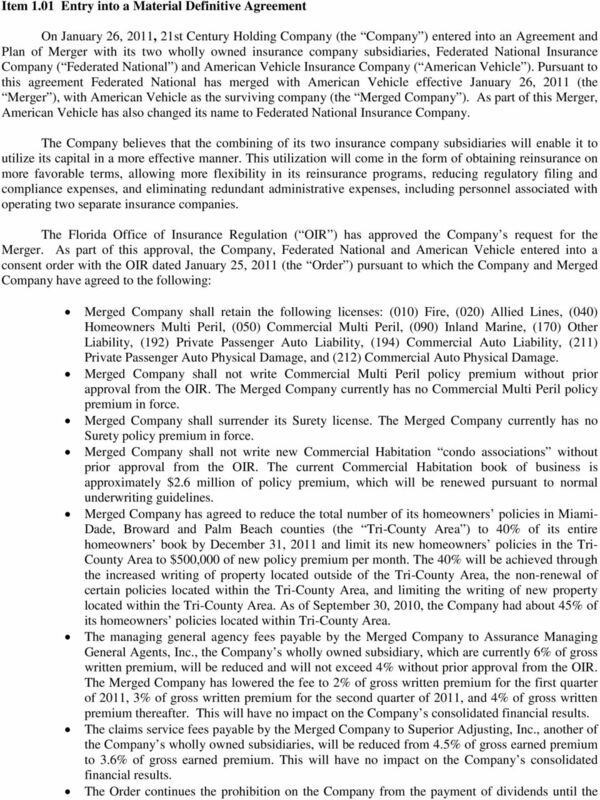 2.3 No Further Ownership Rights in TARGET Common Stock. All COMPANY Common Stock issued upon surrender for exchange of shares of TARGET Common Stock in accordance with the terms of Article 2 shall be deemed to have been issued in full satisfaction of all rights pertaining to such TARGET Common Stock 2.4 Lost, Stolen or Destroyed TARGET Certificates. In the event TARGET Certificate shall have been lost, stolen or destroyed, upon making of an affidavit to that effect by PARENT, COMPANY will issue in exchange for such lost, stolen, or destroyed TARGET Certificate the Company Common Stock deliverable in respect thereof pursuant to this Agreement. 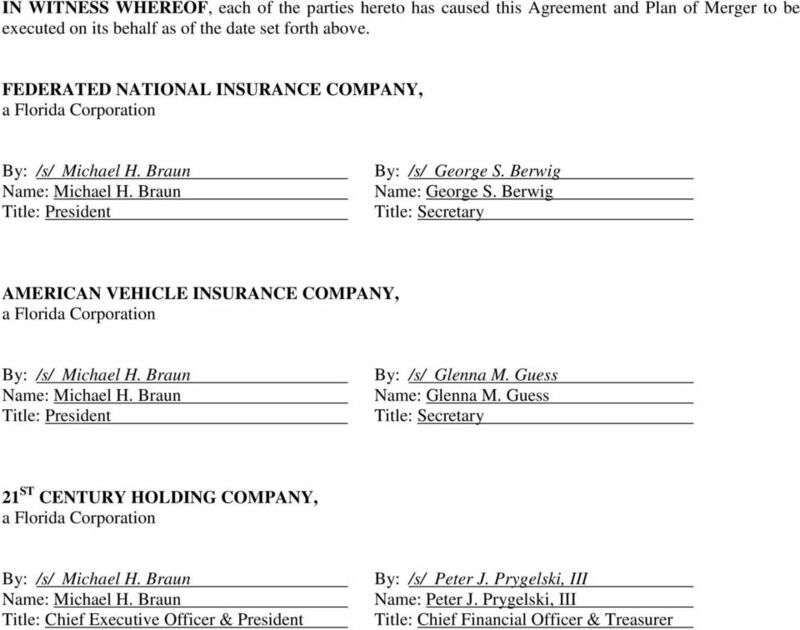 ARTICLE 3 CLOSING CONDITIONS; CLOSING DELIVERABLES AND CONDITIONS 3.1 Conditions to Closing. 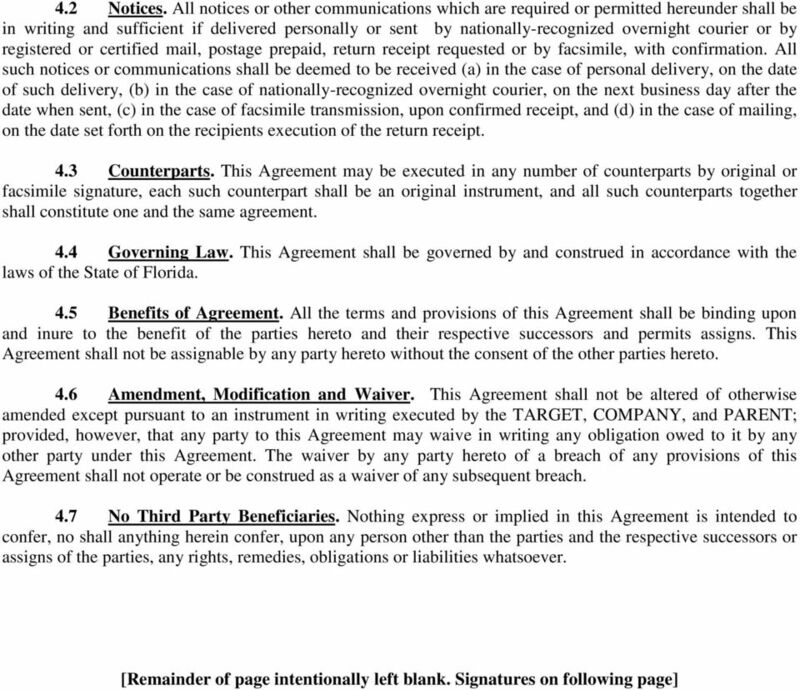 The respective obligations of each party to perform this Agreement and consummate the merger and the other transactions contemplated hereby shall be subject to the satisfaction of the following conditions, unless waived by both parties pursuant to Section 5.8 of this Agreement: (a) Authorization of the Merger. 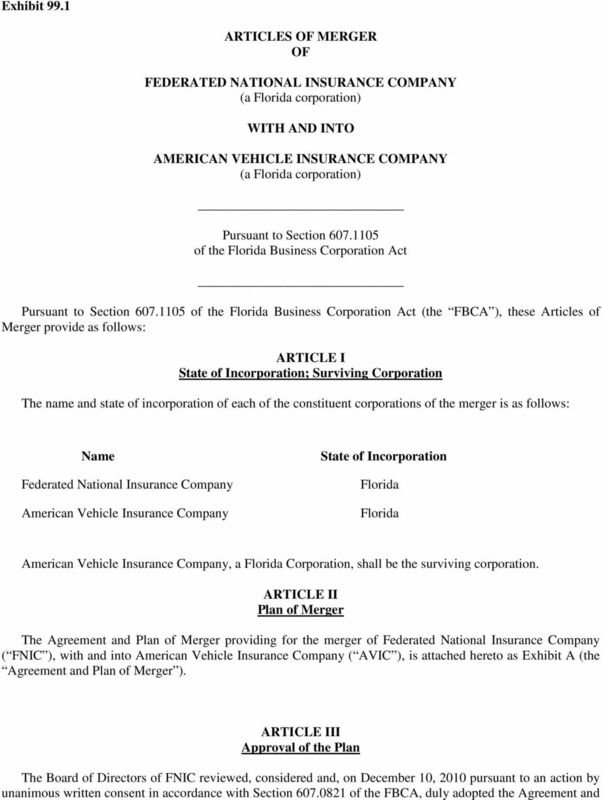 All action necessary to authorized the execution, delivery and performance of this Agreement, the Articles of Merger (as defined below) and the consummation of the Merger and the other transactions contemplated hereby shall have been duly validly taken, and not withdrawn, by the boards of directors and shareholders of each TARGET, COMPANY, and PARENT. (b) Approvals. All authorizations, consents, orders or approvals of, or declarations or filing with or expiration of waiting periods imposed by any governmental authority, including any required by the OIR, necessary for the consummation of the transactions contemplated hereby shall have been obtained or made or shall have occurred. (c) No Legal Action. No temporary restraining order, preliminary injunction or permanent injunction or other order preventing the consummation of the Merger shall have been issued by any Federal or state court other governmental authority and remain in effect. 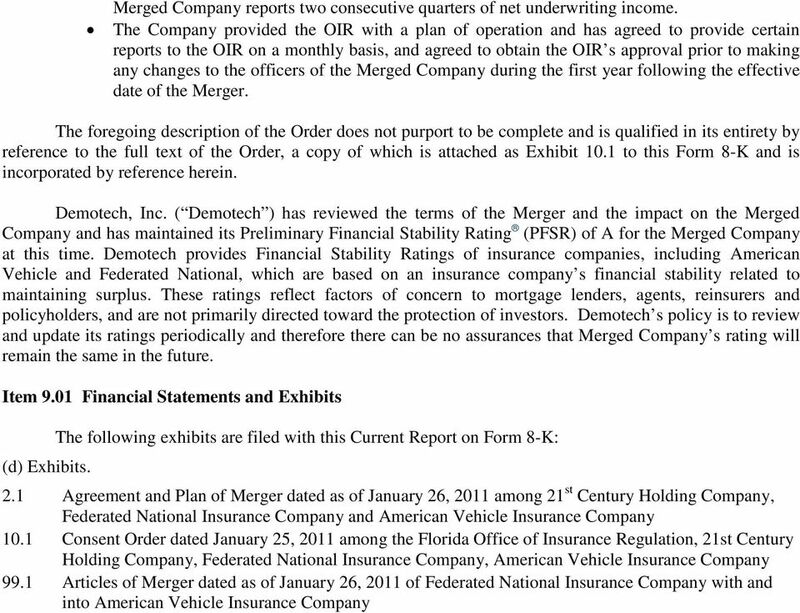 (d) Articles of Merger. 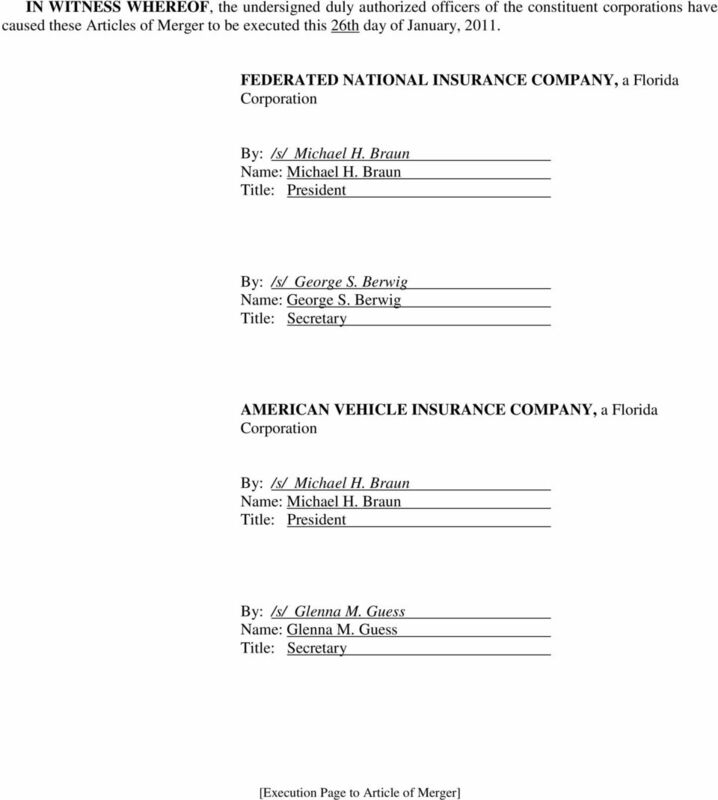 Articles of Merger, satisfying all of the requirements of the Florida Act, attaching this Agreement and in form and substance reasonably satisfactory to all parties hereto (the Articles of Merger ), shall have been executed and delivered by both TARGET and COMPANY and, upon receipt of approval by the OIR and satisfaction of all other conditions to consummation of the Merger, shall be filed with and accepted for filing by the Secretary of State of the State of Florida. ARTICLE 4 MISCELLANEOUS 4.1 Entire Agreement. This Agreement and the other writing referred to herein contain the entire agreement among the parties hereto with respect to the transactions contemplated hereby and supersede all prior agreements or understandings, written or oral, among the parties with respect thereto.